Hey! Thanks for dropping @ my blog. I woke up and got up late this morning. Haha. But it doesn't matter anyway. We don't have classes, we just had a meeting about the event on Wednesday. Haha. Right timing! Btw, I just wanna share something about what happened last night. Susan (Indonesian) and I had finally talked after a couple of years. We're both busy with so many things I guess. She's in her vacation (? ), am I wrong? Good thing for her. 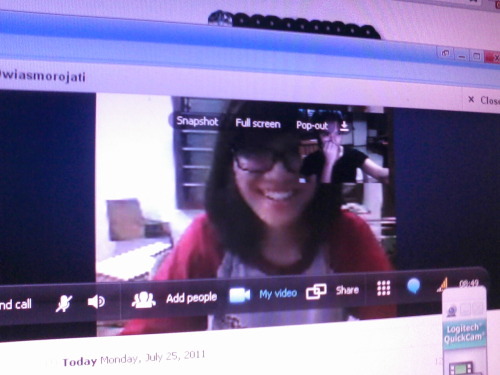 Oh, here's the pic of our Vcall. Actually, this was stolen, but yes, she's still pretty here. Hey! That's me in black. I look awkward, everytime. I know. I did enjoyed talking to her about a lot of things. Yes, I shared some secrets and stuffs. Actually, I really don't wanna stop our conversation, I wanna talk to her bout so many things, but time wouldn't allow us. She told me that her mom's nagging. Hahaha. Shhh.